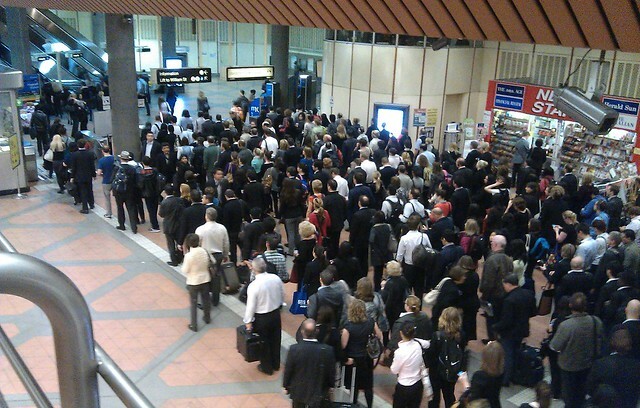 This is Flagstaff station yesterday at 8:50am. It’s not a once-off occurence, but happens regularly. As patronage has grown at Parliament and Melbourne Central, more gates have gradually gone in… fitting more in at Flagstaff is probably a challenge, but one that will have to be looked at, perhaps in conjunction with the conversion from Metcard to Myki gates in the next year or so. But the problems aren’t confined to the station. The footpaths on William Street and also Little Lonsdale Street no longer cope with the pedestrian traffic coming out of the station in the morning, and going back into the station in the evening. Some people resort to walking on the road to try and speed up their journeys. I haven’t got out there with a measuring tape, but my perception is that the footpaths around Flagstaff are narrower than comparable spots around the other CBD railway stations. It’s probably in part due to the fact that Latrobe and William Streets are some of the few CBD streets that allow two lanes of car traffic (in each direction) during peak hours. Street furniture such as news stands and cafe tables are important for the street scape, but don’t really help pedestrian flows. 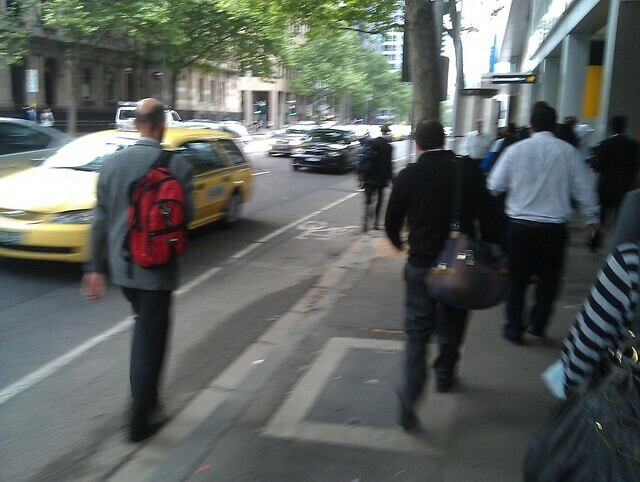 Given a clear preference for sustainable transport access into the CBD, I think it’s time that was reviewed. Something more along the lines of Collins Street might be appropriate — one lane for trams, one lane of traffic, a bike lane, and one lane either for parking or for tram superstops. Of course it wouldn’t help traffic congestion. But parts of that area get clogged in peak hour anyway (especially on Friday night), even with two lanes of traffic. If there are multiple demands on that space, the priority should be for the most space-efficient use of it — which is clearly pedestrians and public transport. I’ve thought similar things about the footpath at Collins and Spring. Betweent the Parliament station exit and Collins it’s chockers. Meanwhile, thre’s about 4-5 parking spots that seem to get limited use – why not widen the footpath, and work on removing obstructions (eg about 3-4 raffic light boxes, which could be consolidated or perhaps shrunk, etc.). Leave a parking bay or two if absolutely necessary, but at 1h turnover it’s maybe 40 people in a day benefiting from the car parks, versus about 150 people per minute at peak, and probably per minute offpeak on the footpath. More gates at stations = always good. Especially when frankenbarriers won’t recognise your myki. When people debate the capacity of the city loop, they usually bang on about the signalling or dwell times. But I suspect that a major capacity issue is simply the ability to get people in and out of the stations. At Parliament, for example, in the morning peak there is almost no capacity to lift more people from the platforms, nor any easy way to add capacity. And, of course, any sustained delivery of passengers from trains greater than the capacity of the escallators would be highly unsafe. I’ve been keen to do an analysis comparing the current patronage levels at City Loop stations compared to the patronage levels they were designed for: unfortunately data is hard to come by. Since the loop opened in 1981 rail patronage has skyrocketed, but knowing how much of this growth is during the morning peak is more difficult to determine. Installing additional ticket barriers on the Flagstaff concourse will require a rearrangement of those already in place, and would be simplest fix to the issue. Adding additional escalators from the concourse to street level will be a much bigger engineering undertaking, it would involve rebuilding the plaza above the concourse, or taking up more land in the Flagstaff Gardens. Inside the station Flagstaff has room for additional escalators: at present there five units running from concourse to platform 1/2 and four units running down from platform 1/2 to platform 3/4. Overall a total of six and six escalators can be installed, replacing the existing staircases – getting the new escalators into the station would be an exercise in itself! A common rail expansion theme that pops up every now and then among the less informed is “why don’t we add more tunnels to the city loop”. Ignoring the engineering difficulty in building more tunnels beneath those already operating, pictures such as the one above show that the current City Loop stations would not be able to cope with an additional 50% usage in peak times. The benefit of the planned Melbourne Metro down Swanston Street is that it would distribute pedestrians over more streets of the CBD. When you look at busy Metro network such as Hong Kong’s MTR their major stations haze dozens of entrances, all linked by a network of underground walkways at concourse level. Melbourne Central is the closest we have at present. While not related to Flagstaff, but keeping with the congestion theme, the leading barrier at the outbound tram stop at Federation Square has been extended to cope with morning overcrowding. There was a trial using temporary barriers which seemed to be effective at moving people further onto the stop, rather than all standing at the very top of the stop, preventing further people getting onto the stop and who ended up stranded on the road or tramtrack. At times it becomes overcrowded regardless. @Andrew 1, yep. And wasn’t passenger congestion at Flinders St one of the primary reasons for building the Loop in the first place? Yeah there is scope to put in more escalators, though from what I’ve seen, it’s the gates that are the bottleneck at the moment, and more escalators up from the platform might make that worse. Assuming (I haven’t checked) that Myki gates are about the same width as Metcard ones, I suspect what they’ll need to do is look at moving the booking office over. Tip for those who get caught in these snarls: it’s quicker to use the gates exiting towards the park, which are few in number but never busy, and then either double-back along the walkway where I took the picture, or go up the stairs and cross back at street level (particularly if you were headed down Latrobe St). No way, they will reduce it to 1 car lane. That’s not going to happen. Traffic is bad on Williams street at peak, especially at the top where i think it merges into one lane. I’m not really sure what can be done exactly. I used to work there 4 years ago and it was quite bad then. Now it would be terrible. One solution would be to encourage people to cross across to the other side of the road at the top of the street. People tend to cross at the bottom.